It is a logistical puzzle to run men's and women's races concurrently on the same course, but it can give the women's race greater visibility. WAREGEM, Belgium (VN) — The men’s peloton in Dwars door Vlaanderen was just ramping up the speed with 75km to go Wednesday when everything suddenly came to a stop. Two ambulances swept down the race course to care for two different crashes in the women’s race, forcing race organizers to briefly neutralize the men’s race just as the peloton was barreling toward the decisive Kluisberg climb, the first major hump in the 179km course. 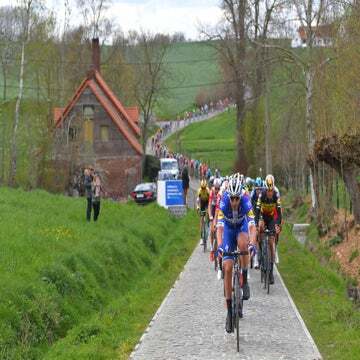 The race stoppage Wednesday in the important pre-Tour of Flanders race was the second incident this spring that saw the men’s and women’s events intersect at inopportune moments. During February’s Omloop Het Nieuwsblad, race officials neutralized solo breakaway rider Nicole Hanselmann (Bigla Pro Cycling Team) after she caught the back of the men’s race caravan. Both neutralizations reveal just how complicated it can be for race organizers trying to hold men’s and women’s race simultaneously on the same roads and finishing towns. The 74th edition of the men’s Dwars door Vlaanderen started in Roeselare while the women’s race started in nearby Tielt. Both ended in Waregem. Along the way, the two courses only intersected in a few key crossing points. But it was during a key sector near the Flemish hills when the two races came into contact. A few things happened. The women’s race had a big pile-up right after the gun, causing organizers to delay the start by about five minutes. The men’s peloton raced hard in the opening two hours, meaning it was moving fast toward the bergs. Then there were two separate crashes coming off some of the major climbs at the back of the women’s race, right at the same point where the men’s race was flying toward the day’s first major climbs. Ambulances were required to attend to two major injuries, including one rider who was transported to a local hospital. And it all happened right at one of the course’s choke points. Commissaires first tried to slow down the men’s bunch, briefly bringing the peloton to a stop. After a short re-start, the call came to neutralize the race to allow the ambulances to follow the women’s peloton back toward Waregem. Race officials said rider safety always has priority over race dynamics and said a full stoppage was the best and only way to safely clear the roads. Riders were upset by the stoppage. Commissaires allowed a breakaway that was already up the road to resume with its lead intact. The grumpy peloton soon filed in behind. Two-time defending champion Yves Lampaert (Deceuninck-Quick-Step) was disgruntled at the finish line after insisting that the stoppage spoiled his chances for a third straight win. The incident and stoppages couldn’t have come at a worse moment for the men’s race, and everyone was forced to stop just as the pack was set to blast into the second of Dwars’s 11 short but punchy climbs. Race stoppages are not uncommon in bike racing. Usually, it’s a passing train that can throw a wrench into a race’s ebb and flow. Occasionally protesters or even extreme weather can force officials to momentarily stop the action. Flanders Classics, the company that puts on these races, holds the men’s and women’s races in close proximity, in part, to bring greater exposure to the women’s events. Several of the major one-days across the Flemish classics have made a big push to include men’s and women’s races on the same day — with junior and U23 races during Gent-Wevelgem — with the women’s peloton often rolling across the finish line a few hours ahead of the men’s. Female riders told VeloNews that they support holding the two races in close proximity to one another. Kasia Niewiadoma (Canyon-SRAM), said she believes that racing close to the men brings more eyeballs to the women’s events. 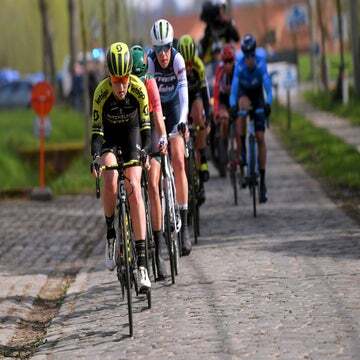 Flanders Classics officials said they will review the incident to see if they can tweak race routes to avoid future conflicts, but said they are fully committed to promoting women’s racing alongside the men. In cycling, the winner is usually right, and Mathieu van der Poel (Corenden-Circus) said that the stoppage didn’t disrupt his game plan for the race or alter his decision to attack.